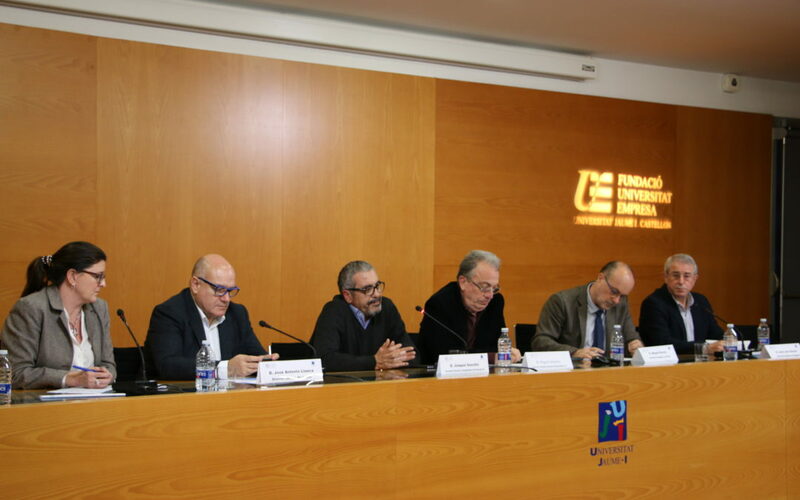 The professionals and academics who participated in the I Conference of Clinical Teachers in Medicine, organized by the Medtronic Chair of Surgical Training and Research at the Universitat Jaume I, have agreed in pointing out the difficulties to combine the professional practice and university lecturing for clinical teaching staff. To ameliorate this situation they have proposed the establishment of new university positions and claimed for greater recognition by the national evaluation agencies. Several professionals from the sector have participated in the conference in person or via streaming. The meeting has served to analyse the difficult situation that clinical teachers need to face nowadays to follow the required accreditation process for university lecturers. “We are facing a complex process with unimaginable consequences,” said Juan Vicente Sánchez, director of the Pre-Departmental Medicine Unit at UJI, when he explained the difficult situation that professionals have to face in order to become proficient in teaching with the current legal framework. This is why medical professionals ask universities to digest symbiotically a profession as complex as the medical one. In this same line, Pablo Lara, vice-president of the Executive Board at the National Conference of Deans of Medical Faculties in Spain and dean of the Faculty of Medicine at the University of Málaga, has stated that there has been a significant decrease in permanent teaching staff in the clinical areas and the situation seems to aggravate in the next decade. The accreditation process of clinical teaching staff is complex due to problems such as the aging of the current staff, difficulty of the accreditation criteria and/or insufficient information about the requirements. For this reason, a change in the legal framework is required to provide a solution to a problem “as urgent as the lack of teaching staff in the faculties of Medicine”. Vicente Bertomeu González, part-time lecturer at the Universidad Miguel Hernández, has explained that “we spend our whole lives studying, and if you want to be a doctor and a teacher at the same time the difficulty increases. “To what extent do we want to have ‘orchestra men’?”, he claimed, showing disagreement with the strict accreditation requirements and the lack of time to reach them. As a solution, a greater recognition of the work done is demanded (prevalence of the quality over the quantity) for the accreditation, as well as a more permissive university system, either by facilitating the creation of pathways to allow a smoother tenure track to clinical professionals or by offering more university placements. Should You Get Genetic Testing for Cancer Risk? Are you interested in this content?